Bolstered by a strong anchor leg from Kirsten Manz, The Foes of Bi$$ captured the featured 3 x 3 km event at the 2013 Wolves XC Relay at the Wapiti Nordic Ski Centre on Saturday. Trailing their arch nemesis, The Friends of Bi$$, after two of the three hilly 3 km legs, Manz quickly reeled in her rival and then pulled away to anchor her team to victory in a time of 40:32, nearly two minutes better than runner-up What is Bi$$? True to form, Sanchez will Lose, met expectations and placed third. The Clairmont Kodiaks #1 claimed the top spot in the elementary 3 x 2 km relay, while the St Kateri Mohawks #1 bested all teams in the Junior High 3 x 2 km relay. Fastest 3 km leg times of the day were recorded by Hayden “Sanchez” Hollowell (10:09) for the men, and Jamie Wigmore (11;45) for the women. Aiden Ropchan had the quickest elementary school 2 km time (10:26), while Amanda Patteson had the best “junior high” 2 km clocking (8;47). 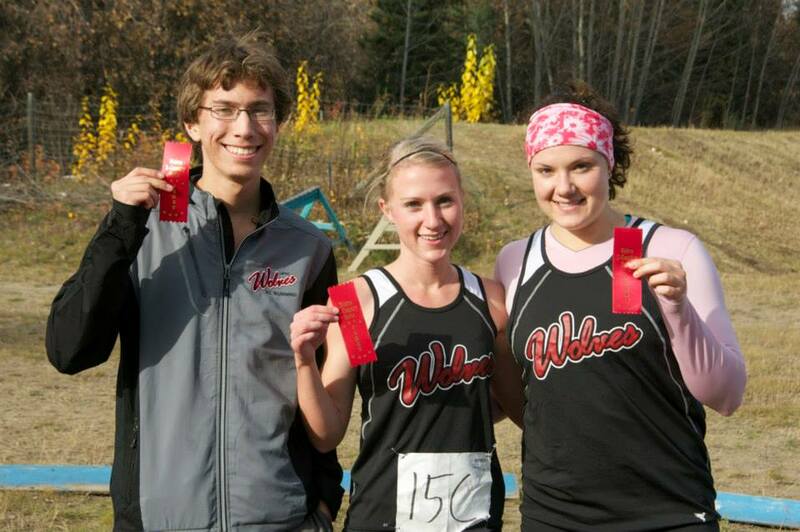 The Wolves XC Relay was the final race of the 2013 Wolves Cross Country Running Series. Full results are posted on the Wolves Series website.